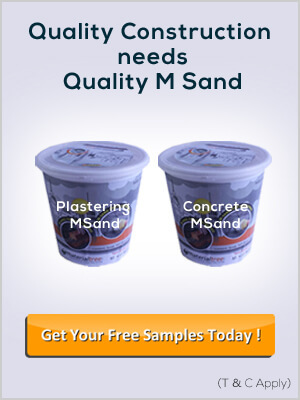 At materialtree.com, you can easily buy construction materials online including Fine Aggregates i.e., River Sand, Concrete MSand, Plastering MSand & Slag Sand which constitutes 60 - 70% of the total concrete volume at the best market prices available in Bangalore. You can place an order for Fine Aggregates through our materialtree.com website, and the fine aggregates of your choice will be delivered freshly from the manufacturer site to your desired project location site with accurate load weightment. Fine aggregates consist of River sand, M-sand and Slag sand used for construction. M-sand is the latest innovation that is considered as a replacement for river sand, as it is a finely manufactured product which yields better results than the traditional river sand. Slag sand is another fine aggregate which is durable with consistent shape and volume. We provide the aggregates with best quality at best prices and from trusted Manufacturers and suppliers. You can also compare the M-sand and River sand before purchasing as we provide free M-sand sample. Know more about the characteristics & importance of Msand.